A key to achieving success in the fashion market is ensuring consistency throughout a line of clothing. A line of shirts has to have the same type of cut, quality, and color to maintain the integrity of a brand. Because denim can be one of the toughest fabrics to work with, maintaining color consistency from factory to factory for a particular brand of jeans is extremely difficult. Heaven help the parent who comes home with a pair of jeans that may match the popular brand and style at school, but that includes a denim that isn’t quite the right color because of a dye process that was slightly incorrect. You might as well have picked up a pair of jeans out of the neighbor’s garbage can. Ensuring consistent color measurement throughout a roll of denim requires a manufacturer to make use of precise measuring equipment, such as a spectrophotometer. The weaving pattern in denim can make it difficult to consistently spread the dye and achieve the desired color consistency. Denim can be a challenging fabric to use for clothing manufacturing for a variety of reasons. The weaving required to create a roll of denim fabric requires precise manufacturing work, but also provides the toughness denim is known to possess. Those challenges carry over to dyeing denim, where the weaving pattern in the fabric can make it difficult to consistently spread the dye across the entire roll. A couple of options for dyeing denim are Indigo and sulfur dyeing. Indigo dyeing is commonly used in denim manufacturing, as few other dyes can match the desirable sky blue color an Indigo dye can create. However, the Indigo dyeing process, if not performed correctly, can lead to undesirable fading after washing. A sulfur dye will typically be a lower cost option for dyeing denim than Indigo, but the color choices are a bit more limited. Most manufacturers will stick to a darker color when using sulfur dyeing. Non-blue colors are common with sulfur dyeing too. Manufacturers of fashion jeans need to make use of color consistency measurements to ensure the denim will fade to the desired color in each product. One of the best properties of denim is the way the fabric fades over time. The faded look can be even more desirable than the original dyed color of the jeans. 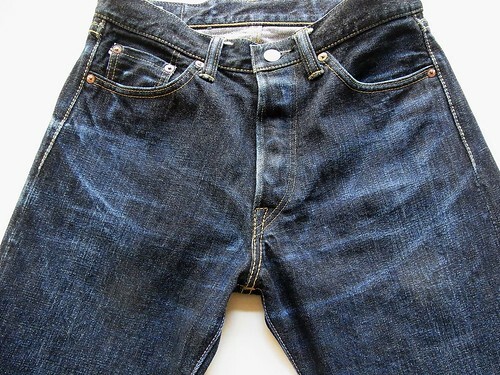 For example, one reason why denim created in Japan is popular is because of the way it fades. Individual brands of Japanese denim are well known for the specific colors they produce after they fade1, but those faded colors must be consistent over time to maintain the brand’s integrity. To achieve a consistent fading process, the dye the manufacturer applies in the production phase must be consistent from fabric roll to fabric roll. A mistake in the original dyeing process will lead to a different faded color than what’s intended, which can be a disaster for a manufacturer of fashion jeans. Therefore, finding a way to consistently ensure the color of the denim dye process is important, which is where spectrophotometers enter the picture. As you make measurements to determine a sample fabric’s color consistency, you’ll need to determine exactly what you want to measure. Color measurement only. 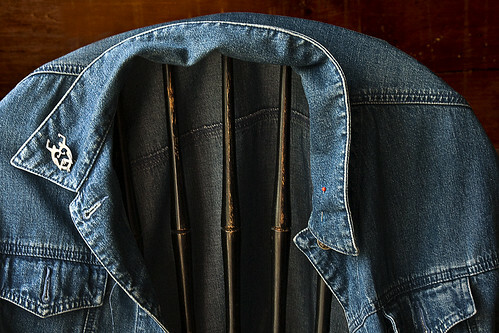 When taking a measurement of a denim sample, you may find that the pattern of the fibers or any gloss on the material may lead to an inaccurate reading. A sphere-based d/8 spectrophotometer using a specular-induced mode can solve this problem by only measuring the color and ignoring any other factors that potentially can affect the measurement. Include surface characteristics. Look for a direction spectrophotometer using 45/0 or 0/45 modes to take measurements of the denim fabric to include surface characteristics with the measurement of the color of the dye. This type of measurement most closely resembles what a human sees when looking at a piece of denim, as our eyes are not going to be able to separate the color from the way the texture affects the color. No matter what type of method of measuring you use, it’s important to create a sample average to negate the possibility of a slight flaw or odd variable affecting the measurement. With the weaving involved in creating denim, it’s important to take samples of different orientations, which will compensate for differences in the measurements based on the direction of the fibers. For the best results consider turning the fabric sample by 90 degrees each time you take a sample measurement with a spectrophotometer, and then average the results. The clear crosshatch pattern of the fibers in denim can make color consistency measurements a challenge without the proper equipment. Finding the right spectrophotometer to meet your denim coloring needs doesn’t have to be a significant chore. Hunter Lab has been offering solutions for analyzing colors for more than 60 years. Please contact us to begin the process of selecting the right tool to meet your manufacturing needs.